This is the first in an occasional series of posts that chronicle HBI’s growing collection of found items in the historic buildings where we work. We launch this series with a focus on Roxbury Action Program at the historic Alvah Kittredge House in honor of African American History Month. Recent history is often the casualty of historic preservation. Fifty years is generally the preservation regulator’s threshold age for declaring something “historic.” We inevitably find objects in historic buildings that have been closed or boarded up for years that are of no financial value, but for us represent a gold mine of recent history and fill the story void of the last 40 to 50 years. At the 1836 Alvah Kittredge House in Roxbury’s Highland Park, boarded up for 20 years and seriously deteriorated, HBI’s structural engineers and architects entered recently to examine the house’s structural problems. 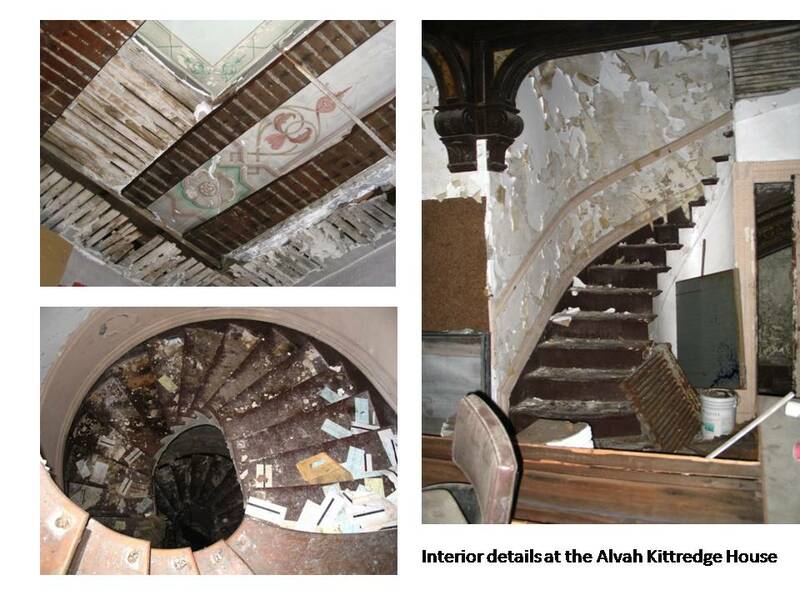 They found more than columns and Greek Revival period decoration; they brought back photos and material from the period of time when the Kittredge was the “RAP House,” from 1971 to the 1990s, home to Roxbury Action Program (RAP). The non-profit RAP, a community development organization, was founded in 1968 to build a model community for African Americans that would promote economic stability, physical development and social responsibility. RAP purchased the Kittredge House in 1971 and made it their headquarters. So, what did we find? On the foyer wall is a vibrant mural from the RAP era that features many neighborhood landmarks, including the Kittredge House, Kittredge Park and the nearby Alvah Kittredge Park Rowhouses. We don’t know who painted the mural but it illustrates the state of the neighborhood at the time. 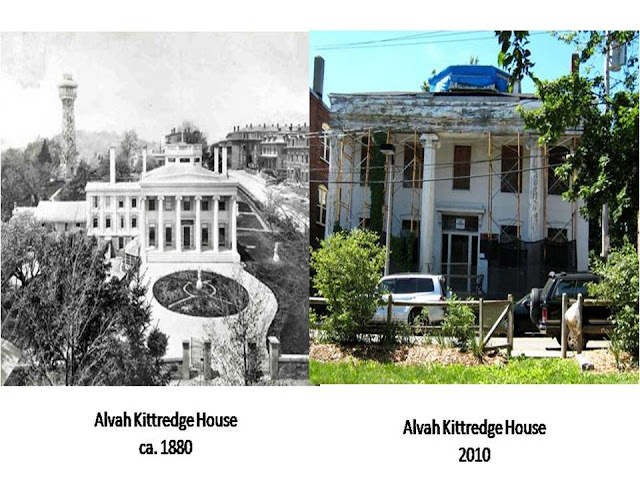 The Alvah Kittredge Park Row Houses, a rehabilitation project completed by HBI in 2002, is shown as a boarded up and deteriorated set of four townhouses, and the Kittredge House gleams a vibrant white with an intact colonnade. Things have changed, but this art project illustrates the neighborhood deterioration of the 70s and 80’s that RAP’s mission aimed to address. We also found RAP newsletters from 1977. In it, Roxbury residents are given tips for saving money on heating costs, eating well, and accessing educational programs. News stories report a new Afro-American Museum at the boarded up Dillaway Thomas House in Eliot Square under the leadership of its director Byron Rushing (not yet a State Representative), and that author Alex Haley planned a sequel to his wildly successful 1976 book Roots. There’s even an historic preservation article: money had been found to repair and paint the beautiful Standpipe on the sight of the Revolutionary High Fort. 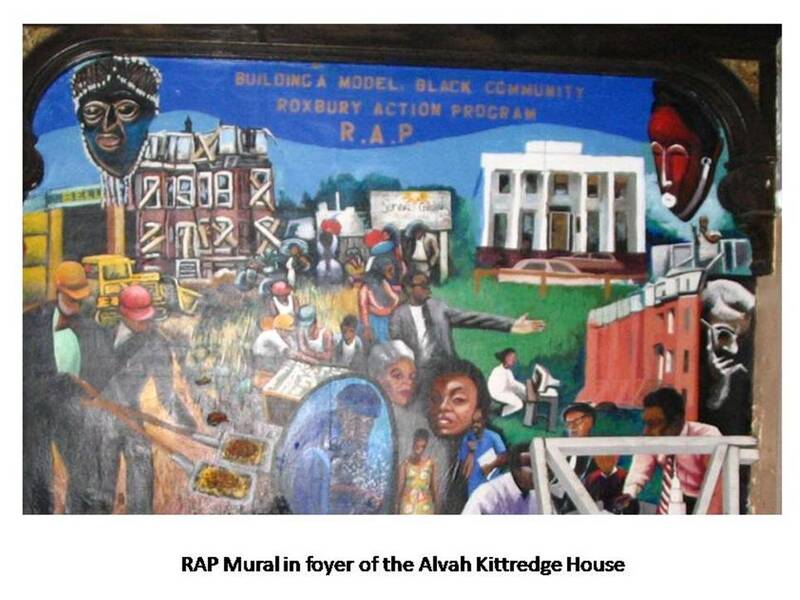 But the 1977 RAP News also helps fill the late 20th century Kittredge House story void by offering insight into Roxbury’s African American community and the broader social and civil rights movement in America. The most striking stories relate to local and national social activism and economic development: a Governor’s Conference on Community revitalization hosted by RAP, editorial opinion on the Carter Administration’s welfare reforms, community support for black prisoners at the Norfolk Prison, and warnings about legal consents required for federally funded sterilization programs for women by the Boston Committee to End Sterilization Abuse. HBI keeps these items – these time capsules, really -- in property files at its offices, but we would like to find a way to preserve some of this material history as well as we preserve buildings, and make sure they are as widely available as possible. If anyone has ideas of where to submit these materials, please comment below. 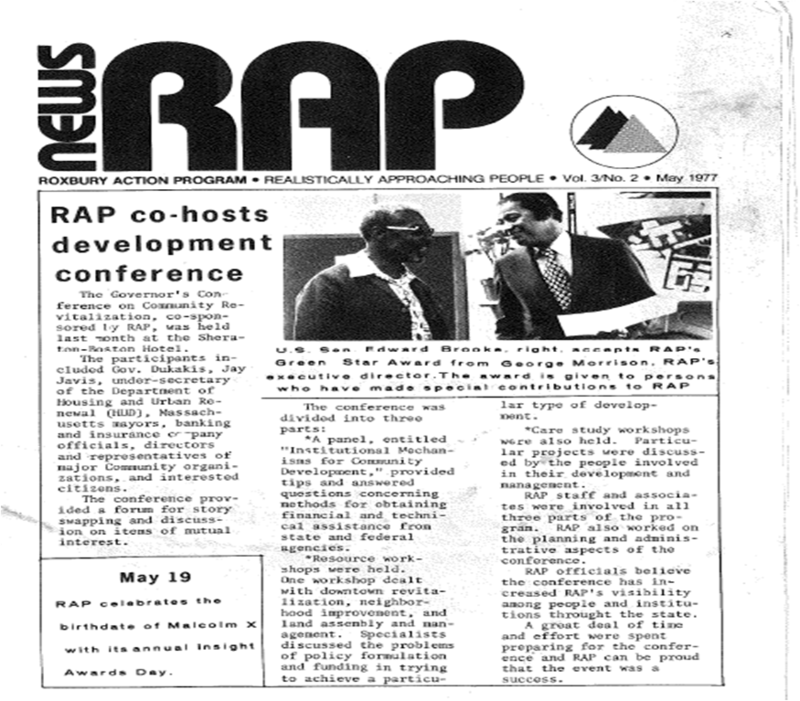 If you'd like to see a scanned copy of the RAP newsletter, please contact shelby@historicboston.org. How neat is this! A window into the past and yet another strong argument for the preservation of historic buildings - you never know what's inside and the great significance it may have for local citizens and local history. Keep up the great work, HBI! I can't tell you how excited our community is to receive HBI's support in the preservation and restoration of this historic structure. This coupled with the wholesale restoraton of Alvah Kittredge Park should go a long way toward transforming AK Square for us all. Thank you! I want to know more about what hapened to RAP (and the house)! I suggest the BPL or Historic New England Lcondon@historicnewengland.org has possible repositories for the newspapers. I'm sure Discover Roxbury would be interested, too. Margo- We are always surprised what we come across in these great buildings. Thanks for the comment! Anonymous- Thanks so much for your great comment. I have passed it along to the rest of the HBI staff. We are thrilled to be a part of a greater neighborhood effort to revitalize Alvah Kittredge Square. Ken Turino- Historic New England is a great suggestion. We will get in touch with Lorna. Thanks! Judy- Discover Roxbury is another a great idea. We will get in touch with Derek and see if they might be interested in a copy. Thanks!